I am not much of an activist. I have never had a cause to support or even really wanted to have a cause to support. I was happy working, playing with my kids and drinking wine at night with Mike after the kids were tucked safely into their beds. I vote for the president and I stand up for myself and my beliefs when I need to, but I don't really have one thing I support and pour my heart into. By having Ella I now have something that I not only support but will be pouring my heart into. The day after we had Ella, I told Mike I was going to take everything that has happend to us and everything that I will learn as we go along and I am going to use it to make a difference. 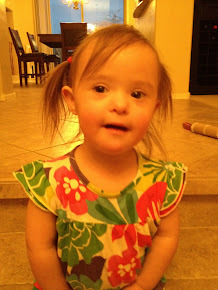 I really think what I want to do is be there for moms and dads right after they find out the diagnosis of Down syndrome. I can't tell you how important it was for us to have people come visit us in the hospital who listened to our feelings and then validated our feelings of loss and selfishness. Alot of what I was dealing with was how horrible I felt over how I reacted to the news but hearing other moms tell me they felt the same exact way made me be able to put those feelings to rest and just get on with our new lives. I know that I am not expert on Down syndrome, Ella is only 4 weeks old after all, but I am an expert on processing the raw emotion of receiving crazy, life altering news and not driving my car into a river to deal with it. I want other moms and dads to cry and know it is OK, I want them to know that I did think for about 2.5 seconds about just giving her to a family that could handle a special needs child and that it was ok to feel that way, that you will love your new baby so much that it will all be just fine. Your baby needs you, but in a way, you learn you need them more. You need them to look at you and grab your finger and fall asleep on your chest and just do those baby things to help you remember to take it one step at a time and to cry when you need to and to hate the world still every now and then but that you have a baby that needs you and that's the only thing that matters. New moms and dads of a Down syndrome baby need to know that life isn't over. I want to help them with that. SOOO, why all this talk about my new found feelings of wanting to help others?? Well, tomorrow is World Down syndrome Day. I have one request for all of you. Send my blog to other families you know because somewhere out there is a parent who will be just where I was 4 weeks ago and they might just need this little blog to help them out in those first few days. They might need to talk to a new mom and dad of a Down syndrome baby and I want to be there for them. As Ella gets older I imagine we will use these types of awareness days to help raise money for research for those with Down syndrome, but right now, only 4 weeks into it, all I can offer is my support to those who are just like us. On another topic, I am feeling guilty.. Why? Because I have 2 other kids and no other blogs named RaisingRyanMichael or RaisingReedMatthew.com... I think I have already taken more pictures of Ms. Ella than I have taken of Ryan and Reed combined in the last 6 years. I feel like if my other two kids knew how to type a web address into the browser window and saw how much time I am spending on blogging about Ella they would use it to get more toys and a later bed time... I know that this is a silly feeling and Ryan and Reed are just fine and in fact I have been so much more aware of spending time with them lately that they are probably sick of me hanging around them so much, but I still feel bad. I think this has to do more with learning how to juggle the needs of 3 kids more than anything else, but mommy guilt is no fun. I keep telling myself that Payton and Eli Manning are 2 of a 3 kid household and they all turned out just fine, but because none of my kids are exhibiting superior football skills quite yet, it isn't helping as much as I would like it too. I just don't want my kids to be the one on a reality show one day saying that had their mother just of paid them a little more attention they wouldn't be searching for their 15 minutes of fame by eating cockroaches or proclaiming their love to a washed up singer. So, because of that fear, I took pictures of all 3 of them tonight and I sat and watched The Princess and the Frog with them and I read about kangaroos and I let them have popsicles and stay up late. I also practiced throwing a perfect spiral with them and talked about how silly March maddness is (really Kansas and Villanova????) They better remember this!